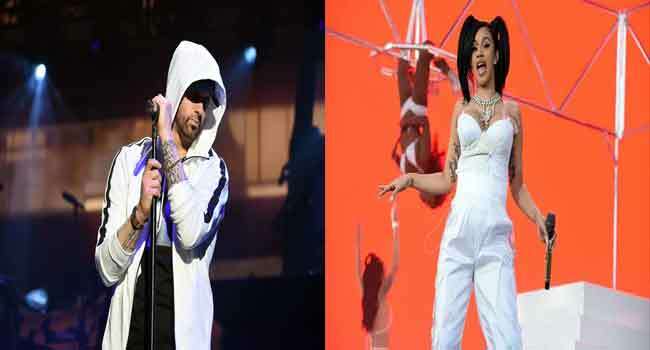 Eminem and Cardi B may be at different stages of their careers, but the two rappers have one strategy in common — when playing Coachella, go big. Closing the three-day bash Sunday before thousands of often scantily clad revelers in the California desert, Eminem offered a disconcerting trip to “8 Mile” — a stage replica of his blighted hometown Detroit, cast in an even harsher light through special effects of rain and then arson. Eminem brought out 50 Cent, joining in the New York rapper’s birthday anthem “In Da Club,” before the crowd erupted on sight of the elusive Dr. Dre, Eminem’s mentor. Coachella marks one of the first concerts for Eminem, who is 45, since the release last year of his album “Revival” after a four-year hiatus. Eminem, by far the most succesful white rapper of all time, found a new political voice on the album as he lashed President Donald Trump, although “Revival” mostly received poor reviews on its musical merits. Cardi B was one of the most avidly awaited performers at Coachella, not only because she is rising quickly in hip-hop but because the 25-year-old — engaged to fellow rapper Offset of Migos — recently revealed that she is pregnant. Despite her visible baby bump, Cardi B briefly squatted to twerk to the beat, comfortably getting back up to finish her dance moves. She saluted her former profession in her tight, half-hour set as dancers stretched acrobatically on strippers’ poles. She also brought out her own celebrity guests including Chance the Rapper. After the hard edges of her breakthrough song “Bodak Yellow,” Cardi B has shown greater musical versatility. Her debut album, “Invasion of Privacy,” brought in energetic, street festival-style horns on the track “I Like It,” which she performed live at Coachella. Cardi B has demonstrated striking candor about the finances of playing Coachella — arguably the most watched festival in the world, especially this year with Glastonbury in Britain on a scheduled break. She told satellite radio SiriusXM that she spent $300,000 of her own money to develop a worthy set for Coachella, where she will earn only $140,000. That sum — presumably reached before Cardi B’s recent meteoric ascent — also includes a performance next weekend, when Coachella reconvenes for a second edition with an identical lineup. Coachella prides itself on both recognizing rising artists and showcasing splashy headliners, with pop superstar Beyonce on Saturday putting on her first show in more than a year. Young British rocker King Krule performed a set of his explosive punk-infused jazz while French DJ Petit Biscuit packed a tent full of thousands of revelers with his guitar-infused yet minimalist electronic tracks.